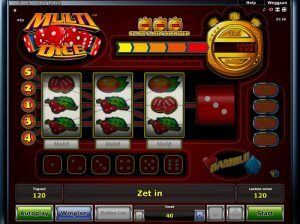 Multi Dice, brought to you by NovomaticCasino.co.uk is a totally unique slot game. What might seem at first glance like a simple 3-reel, 5-payline slot is actually anything but! Packed full of special features, bonus games and much, much more – this game is not to be missed! Fans of Amazing Stars, Garden of Riches and Simply Wild will go wild for this slot game and it’s easy to see why, once you start playing! Slots have been popular games since the 1800s and, whilst the technology has evolved considerably since the first slot machine was invented, the classic symbols have stuck around and prevailed to today – even in online slots such as this one. Fruit fanatics will be happy to know that Multi Dice is packed full of vitamins! Fruit symbols in this game include: cherries, lemons, oranges, plums, watermelons and grapes. Other old-school slot symbols include: the golden bell, the red seven and the star. Like most other NovomaticCasino.co.uk slots, you can play Multi Dice for free until you’re ready to play for real – and you’ll only receive the wins when you do play for real! The aim of the game is to spin three matching symbols on a winline in order to get a payout – and the payout will depend on both the symbol and the amount of your bet. Your bet is displayed at the bottom of the screen, along with your credit balance and last win amount. You can alter your bet by using the plus and minus symbols to either side of it, and then you can check the paytable to see how much each combination of symbols will pay you, according to your bet amount. Every time you get a win, you have the option to gamble it. All you have to do is guess whether the next card will be red or black by clicking on the heart or spade symbol respectively. Get it right and you’ll double your win, get it wrong and you’ll lose it. Once you’re familiar with the game, you can put it into autoplay mode, which allows the reels to spin themselves without you having to keep clicking, however during this mode you won’t be able to change your bet or gamble your wins. The first special feature, which is active during the whole game, is the hold feature. This activates when you spin the reels and don’t get a win, but two of the reels each have part of a potential winning combination of symbols. In these cases, those two reels will automatically be held and the third reel will be spun. You can cancel the hold feature if you want to, as well as choose manually which reels you’d like to hold and which you’d like to spin – if any at all. On top of this, there are two special symbols in Multi Dice which offer bonuses. The first is the ‘Cash Unlimited’ symbol. At the top of your screen, on the right, you’ll see the ‘cash unlimited’ golden timer, and every time you spin the reels, this golden timer will show a different amount. If, during a spin, you manage to spin three ‘cash unlimited’ symbols, this amount will be added to your balance! The second special symbol is the pair of red dice. Whenever three of these symbols fall on the reels, and they don’t have to be in a winning combination, the ‘Multi Dice’ feature will be triggered. To begin this feature, you’ll have to roll the dice! The number it lands on will be the amount of winning spins you’ll receive. These spins are guaranteed to be winning spins, either giving you cash or more free, winning spins! The hold feature won’t be active during the ‘Multi Dice’ feature, but so long as you’re in manual mode, you’ll still be able to gamble your wins – which potentially can come with a multiplier of up to x5!